Giving of gifts is just one of the languages of love that you can utilize to show your love to your significant other. The monetary value of your gift doesn’t usually matter as “it’s the thought that counts” when you have something you want to give to the other. It doesn’t mean to say that couples should eschew giving jewelry as gifts. In fact, when a man gives jewelry–of good quality–to his lady love, it usually signifies a serious shift in the relationship and shows that he is committed and quite possibly in it for the long sweet haul. If you look into the glittery gift your partner has given you, it gives some insight into the depths of his feelings for you. When a man is truly devoted to you, he won’t scrimp on quality. He won’t buy you costume jewelry but will invest in something that will last–just like how he feels about your relationship. The gift doesn’t have to be very expensive to prove the extent of his devotion to you. He will also have to give much thought in choosing such a present for you, which will inevitably reveal just how much he knows and understands you inside and out. Aside from the quality, the fact that it is thoughtfully selected adds even more value to the gift and make you happy. Gemstones comes in all sizes and color and also differ in meaning. Choosing the right one can make your gift of jewelry all the more meaningful especially if you discover the meaning behind these precious stones. The easiest route to go would probably for your partner to choose your birthstone. I think that a little spontaneity can also be good like choosing sapphire because it reminded him of your eyes and not just because this stone is said to symbolize fidelity as well as sincerity. A nature-loving girl will probably green colored stones like emerald or jade. If your partner chooses a fiery stone garnet, it is said to represent love, passion as well as loyalty. Part of what makes jewelry giving special is when it is personalized to tailor to your likes. If your significant other knows you are more of an earring person, then he knows to give you a pair instead of giving you charm bracelets or necklaces. He would probably choose a design that he knows you will like or something that reminds him of you. Some would actually allow their partners to pick the jewelry that they like but I think that will ruin the surprise. You can help out your sweetheart by giving hints and browsing through sites like David Yurman so he can have an idea of the type you like and make it easier for him to choose something that would suit you. Just because you’re a woman doesn’t mean you can’t give your man jewelry. There’s no double standards when it comes to jewelry giving. You can give tag necklaces or rings but when it comes to the latter, you can be more creative like this geek-inspired ring for batman fans. Bey once may have sung about “Single Ladies” and how men should put a ring on them if they like them, why not be different and propose with this one-of-a-kind ring? 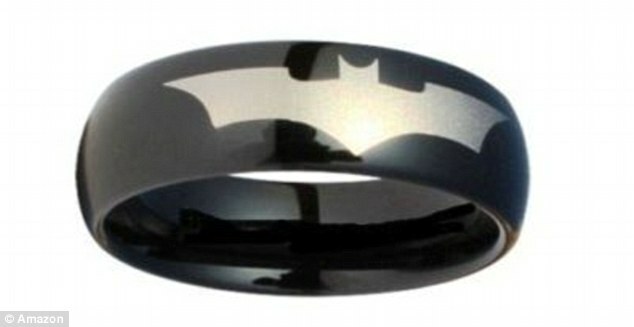 If your hubby-to-be is a huge fan of the caped crusader then he won’t be able to say no. If you or your partner are not quite ready for marriage yet, then you can compromise and settle on the next best thing–sealing your bond with promise rings. If you’re finally ready to embark on the next stage of your relationship, you can then replace your rings with a new promise as you make your vows with wedding bands.